We've passed by Pearl Café but found it standing room only and we tend to avoid places where we have to queue but today, we've managed to snag ourselves a table. Truth be told, 5 minutes later and we'd have missed out again. There are only 5 tables for 2 and 3 tables for four and two tall tables in the centre that seat another 12 people on some rather hard stools. The crowd on this day wasn't quite what we had expected - instead of the beautiful people we had, as Paalo described, the "4wd BMW empty nesters from Toorak who only cross the river to eat at Pearl Restaurant." I dare say the weekday crowd would be different - there are a lot of offices around and those designer brown bag lunches must be popular. 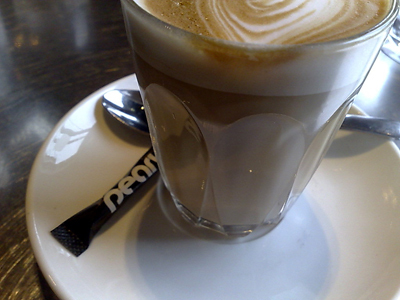 The coffee is quite good, nice and creamy. Menu wise, it is pretty straightforward and is divided into Breakfast (fruit salad, bircher museli, muffins etc, various toasted breads, waffles, 2 breakfast panini and a section of coddled eggs with 6 different "fillings"), Autumn Lunch (4 salads, 2 soups, 1 curry, 1 pie and macaroni cheese), Baguettes/Sandwiches/Toasties (5 options) and finally Something Sweet and "A little something sweet" for the tiny treats like hedgehogs and lamingtons. The tables are set with chemistry beakers which are used to house the cutlery. Unfortunatly on our table, 2 of the 3 sets had caked on egg stuck on the fork twines. Not really something I would expect to find here. 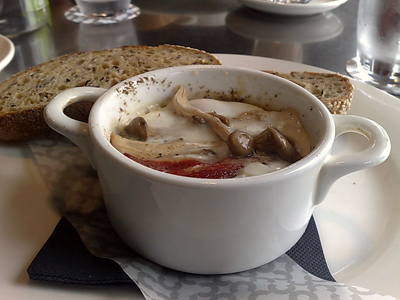 I have the Coddled Eggs served with Wild and Gathered mushrooms, double smoked bacon, sage and burnt butter, toasted multigrain. Presentation is very cute served in those tiny casserole dishes - they come to the table lid on with the wait staff removing them. A predominance of pepper made it less enjoyable for me and I only tasted the sage in virtually the last mouthful, a pity as the sage really goes well with the mushrooms. 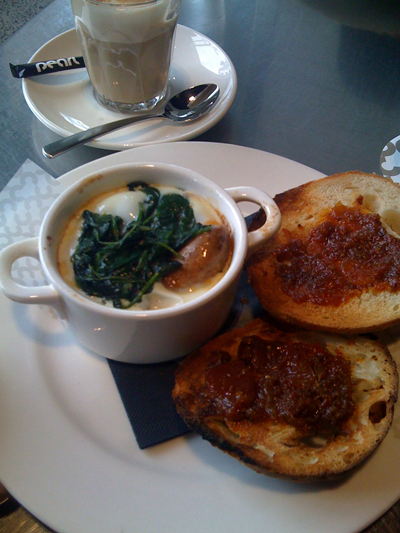 Paalo has: Coddled eggs with buttered english spinach, little lamb fennel seed sausages, spicy tomato jam on pearl bread toast. 2 little sausages sit in this offering and was enjoyable. 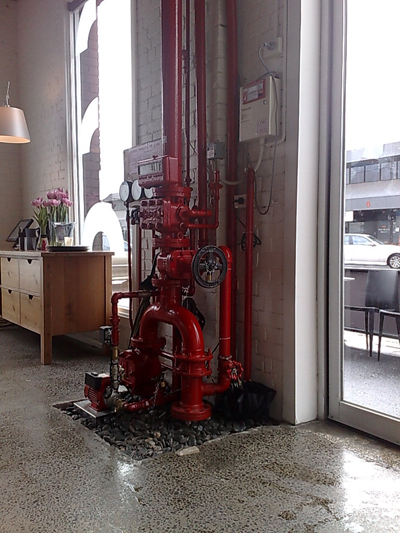 If you visit, be sure to count the number of padlocks on this!